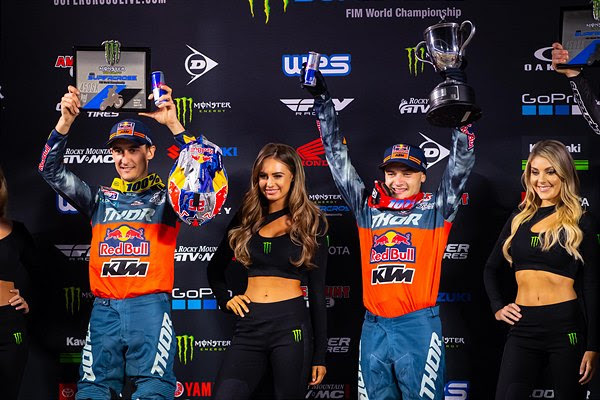 ANAHEIM, Calif. – The Red Bull KTM Factory Racing Team had a breakthrough evening at Angel Stadium on Saturday as riders Cooper Webb and Marvin Musquin secured first and second-overall at the first ‘Triple Crown’ event of the 2019 AMA Supercross Championship. The overall win proved to be a monumental one for Webb, who collected his first-career 450SX victory with steady 1-1-3 finishes across the three-Main Event format. Musquin also had a season-best performance, finishing a close second with 3-2-2 scores.